One process that Allen Gunn mentioned, which should work well for any size of organization, involves setting up a simple spreadsheet template to help you organize your social media and other web content publishing. Across the top of your spreadsheet, you’ll list your available channels – “Announcement Methods” – such as Twitter Tweets, Blog Posts, LinkedIn Updates, Email List Blasts, Website Updates, Facebook Status Updates, Facebook Event Posts, Monthly eNewsletter, or whatever other methods your organization might use. Each of these headings is subdivided into columns for each of the associated accounts: for example, if you have three staff members tweeting on behalf of your organization from their personal Twitter accounts, each of those accounts would be listed under the general Twitter heading. If your nonprofit runs or contributes to several blogs, you’d give each of those a spreadsheet column in the Blog Posts category. And so on. Down the left side, you’ll list your various Content Types, such as website updates, blog posts, events, new publications, press releases, e-newsletters, new staff or board member announcements, or whatever else your organization might tend to publish online. Planning your content distribution is now a relatively simple matter of deciding which box gets an X for action. In the Aspiration Publishing Matrix, for example, the well-publicized “Asp. Event” gets an X in almost every column – it’s easy to see at a glance where the message will be distributed. There’s no reason why you couldn’t extend the matrix to include offline communications, as a matter of fact – and from there it’s a short step to creating a full-fledged “to do” checklist for your content-creating staff members and volunteers. 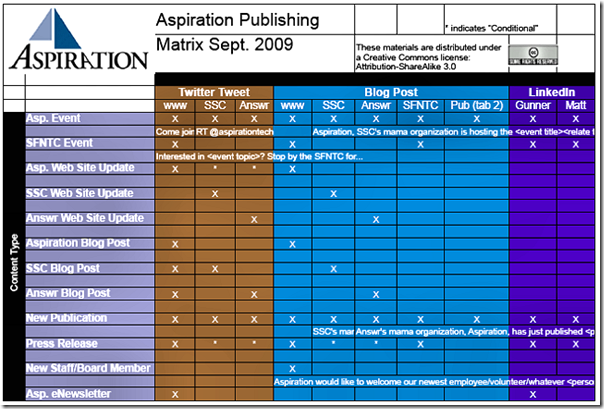 Could a publishing matrix like this help with your nonprofit’s communications plan? Note: The audio recording and PowerPoint slides for Integrating Social Media into Your Website are available on the TechSoup website, in the TechSoup.org Talks webinars section, where you’ll find lots of good free archived webinars aimed at helping nonprofits make the best use of technology. Do you usually distribute the matrix to the entire office via a GoogleDoc type idea? Or, is one person in charge of keeping tabs on everything? I'm starting to develop a social media plan for a non-profit and I think this idea was useful. We're planning on hiring one staff person to oversee the process, but we also want to involve the organization's staff. I was thinking it would be nice to devise a schedule where each person is required to blog or tweet about their research once a week or something. That way, we could get everyone involved with no one being over committed. Have you tried anything like that in your organization? That all looks very interesting and useful, but I don't see anything on the spreadsheet about interacting and building relationship. I hope that was in the conversation because the spreadsheet sends the message that social media is basically another broadcast tool.